Lingfield is justly proud of its Meals on Wheels Service. The meals are cooked and delivered by volunteers from the community. The purpose-made kitchen is fully compliant with food hygiene regulations. 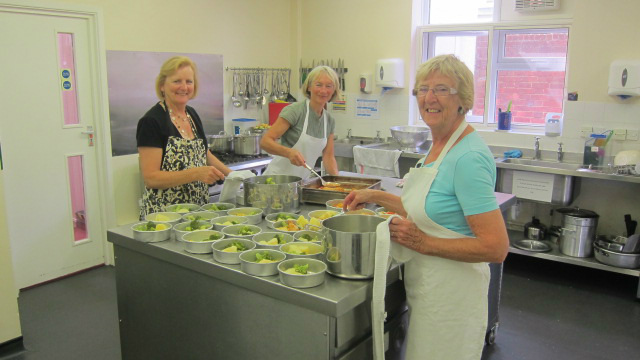 Meals on Wheels is a voluntary service, which offers freshly cooked nutritious lunches every week, Monday to Thursday. It is available to housebound residents of Lingfield, Dormansland and Crowhurst, who are unable to cook for themselves. Our older folk are often very independent and don’t like to ask for help, so requests often come from family, neighbours or doctors. If you think someone you know would really benefit from this service please call us to discuss, or click on the "Contact Us" link on the menu bar above. Meals on Wheels is based at Lingfield Day Centre, High Street, Lingfield, Surrey, RH7 6AB.